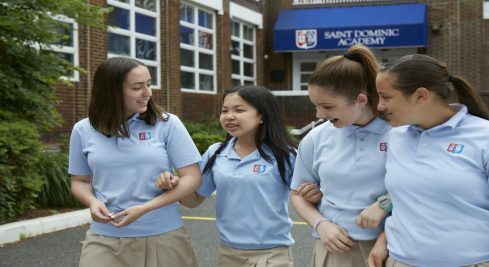 Saint Dominic Academy, an independent, Catholic college preparatory school for girls in grades 7-12, has been empowering young women for leadership since 1878. Sponsored by the Sisters of Saint Dominic of Caldwell, NJ, Saint Dominic Academy is rooted in Christian values but proudly embraces its richly diverse community of learners. We are a community of many different ethnicities, religious backgrounds and heritages. The Academy is located in an historic building at 2572 John F. Kennedy Boulevard in Jersey City with an Annex building, Siena Hall, located on nearby Fairmount Avenue. Bus transportation is provided throughout Hudson, Bergen and Essex counties and also from the NJ Transit terminal in Hoboken. In all grades, 7-12, the Academy’s college preparatory program features a rigorous academic curriculum, including honors and advanced placement courses. A rich array of co-curricular offerings includes award-winning athletics, a National and State champion dance team, literary and artistic publications, service opportunities and a comprehensive women’s choral program, which along with winning many regional and national competitions, has sung at the Vatican in Rome, Carnegie Hall and Radio City Music Hall. Students can enter the Academy in 7th or 8th grade and spend 5-6 years, or go the traditional high school route and attend for grades 9-12.